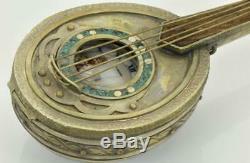 ONE OF A KIND Imperial Russian award Moser watch&silvered/Malachite Mandolin box. 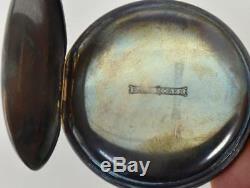 ONE OF A KIND antique Imperial Russian Officer's award gun metal pocket watch by Moser &matching silvered and Russian Malachite semi-precious stone carved Mandolin shaped box c1900's. 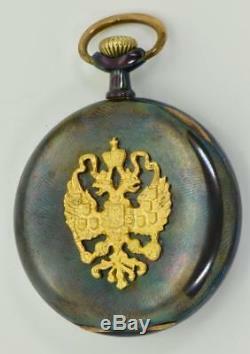 The watch has been awarded to the Imperial Russian Officer Captain Igor Alexandrovich Mishin for bravery. 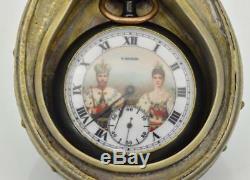 The watch comes from his family estate. The family of Captain Mishin emigrated in Varna city(Bulgaria) after the Communist revolution c 1917. 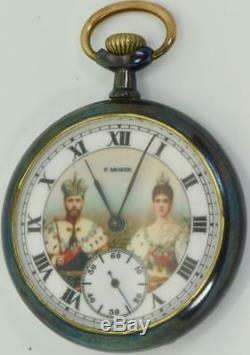 This is much more than a pocket watch -this is a piece of the history. The watch has a military style polished gun metal case with gold filled trim and decorated with the Imperial Russian crest. 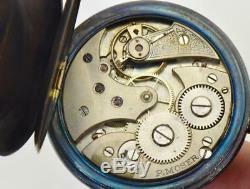 High grade 15 jewels movement, lever escapememnt, Breguet spiral, Guillaume balance. 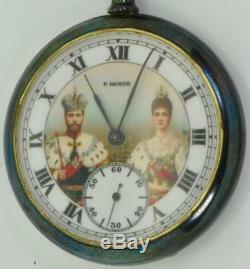 Fine enamel dial depicting the portrait of Tsar Nicholas II and Empress Alexandra Feodorovna. NOTE:PLEASE OBSERVE CAREFULLY THE PHOTOS! 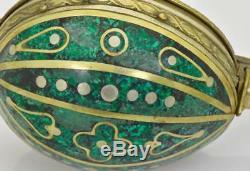 IT IS A SIGNIFICANT PART OF THE DESCRIPTION. Every potencial defect which is shown in the photos, but not mention in the description, will be considered for described. All the photos shoot by professional Nikon 105 Macro lens under 40x diopter magnification, so you can explore even the smallest detail like under microscope! Auctiva Offers Free Image Hosting and Editing. 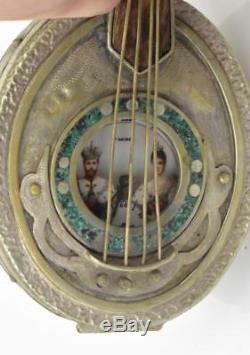 The item "ONE OF A KIND Imperial Russian award Moser watch&silvered/Malachite Mandolin box" is in sale since Thursday, May 31, 2018.